Some Basic Concepts. Economic theory of depletable resources: An introduction (J.L. Sweeney). The optimal use of exhaustible resources (G.M. Heal). Intertemporal consistency issues in depletable resources (L. Karp, D.M. Newbery). Analytical Tools. Buying energy and nonfuel-minerals: Final, derived, and speculative demand (M.E. Slade, C.D. Kolstadt and R.J. Weiner). Mineral resource stocks and information (D.P. Harris). Strategies for modeling exhaustible resource supply (D. Epple, J. Londregan). Applications to Policy and Forecasting Issues. Natural resources in an age of substitutability (P. Dasgupta). Natural resource cartels (D.J. Teece, D. Sunding and E. Mosakowski). The economics of energy security: Theory, evidence, and policy (M.A. Toman). Natural resource use and the environment (C.D. Kolstad, J.A. Krautkraemer). Energy, the environment, and economic growth (D.W. Jorgenson, P.J. Wilcoxen). 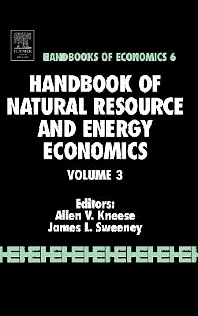 The Handbook of Natural Resource and Energy Economics examines the current theory and sample current application methods for natural resource and energy economics. This third volume deals primarily with non-renewable resources. It analyzes the economics of energy and minerals, and includes chapters on the economics of environmental policy. The Handbook provides a source, reference and teaching supplement for use by professional researchers and advanced graduate students. The surveys summarize not only received results but also newer developments from recent journal articles and discussion papers.